“Technical English, Vocabulary and Grammar” aims to help you increase your knowledge of technical English and develop your vocabulary and grammar. By working through the materials you should become more accurate and more appropriate in a range of key technical contexts. The book can be used on your own (self-access) or in class (as part of a course). 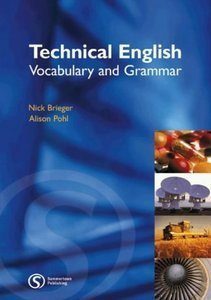 A reference and practice book for learners of technical English at intermediate level and above, it includes: 30 units covering key technical vocabulary drawn from professional activities; company profiles – automotive, pharmaceutical, mining and telecoms; 20 units reviewing core grammar in technical contexts; and a 1500 key technical terms glossary. Review: Excellent intermediate reference for ESL teacher. Each double page spread consists of a page introducing technical vocabulary and a page of exercises. 20+ topics include IT, production, quality control, chemical, cars, health & safety. At the back there is a section of grammar exercises, a glossary and the answer key. Perfect for a teacher teaching in different types of companies.